We strongly felt that a BBQ could be designed much more on an emotional level while still providing all the technical features of other existing BBQs. The looks of the design are inspired on a simple drawing of a rabbit, so the detailing was done in order to strengthen this look (nose, air holes as eyes, grill handles as ears standing up). For the logo, graphics and packaging we also chose to use simple, non-technical language and look and feel. Our client Matro wanted to extend their existing line of brand-less standard import products with a range of new products under a new flagship brand owned solely by them. 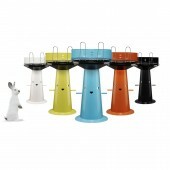 After a series of design and aesthetics explorations the BUCK barbecue was chosen as the first element of this new range. Style and color studies followed, and after the design of all technical plans and production schematics the first prototypes were built and testing for compliance with stringent fire hazard regulations began. Pinkeye was responsible for the design of the barbecue and the whole accompanying brand visual identity of the new higher end range, including logotype, color scheme and even naming. Then we translated these into printed materials, packaging and a website. With the 'Easy Ash Removal System' the user can clean and empty the BUCK BBQ after use by lifting the lid below the grill by the side handles and simply brushing the remaining ashes into the base of the BBQ where they fall into a round container. This container can be entirely lifted out of the base of the BBQ to be emptied in the trash bin. Design started in December 2010 and the product was first launched in March 2012. The challenge was to bring some fun and emotion into a overly technical product category. 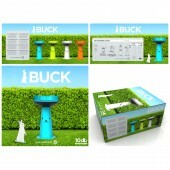 Buck Bbq by Pinkeye is a Nominee in Home Appliances Design Category. 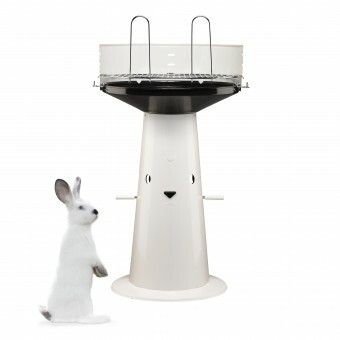 Buck Bbq by Pinkeye is Winner in Home Appliances Design Category, 2012 - 2013. Did you like Pinkeye's Appliance Design? 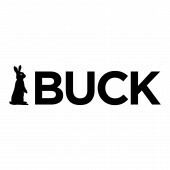 Did you like Buck Bbq? Help us create a global awareness for good appliance design worldwide. Show your support for Pinkeye, the creator of great appliance design by gifting them a nomination ticket so that we could promote more of their great appliance designs.